Win Advent of Code 2018 and Get a Ticket to InterSystems Global Summit 2019! As you know Advent of Code 2018 is in full swing! Till the 25th of December 2018 each day 2 programming problems to sharpen your programming skills! And now we're ready to present great prizes for Members of InterSystems Global Masters Advocate Hub! 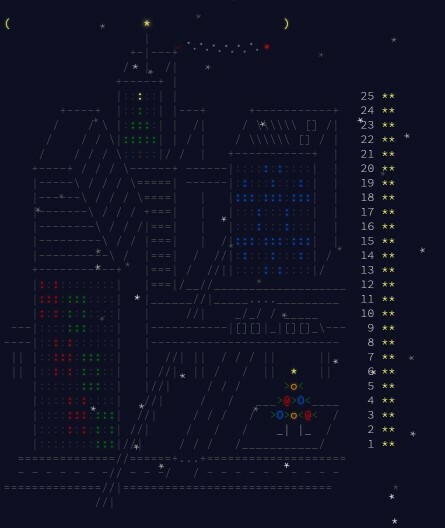 Advent of Code 2018 is over! Thanks for participating in our small but productive COS marathon! And now we're pleased to introduce the winners and distribute all the prizes! AdventOfCode 2017. And The Winner is... Bert Sarens! Thanks for participating in our small but productive COS marathon on behalf Adventofcode 2017! And we are ready to announce the winner but need your public repositories with COS solutions inside. Please share it below in comments. 1st place: Bert Sarens! Repository. From now till the 25th of december each day 2 programming problems to sharpen your programming skills. This is (the end) of a series of programming challenges for beginners and experienced Caché programmers. This is the 25th and last challenge of the 2016 series of Advent of Code. In this challenge, you have to send a signal out, using the assembunny code interpreter that we had to make in earlier challenges. This is a series of programming challenges for beginners and experienced Caché programmers. Today, you need to find your way through a maze (again). There are 8 points of interest in the maze, and you have to visit them all, starting with point 0. You may visit some points more than once, in random order. The challenge is to find the shortest path through the maze while visiting all points. Remember the assembunny language we had to code on day 12 (https://community.intersystems.com/post/advent-code-2016-day12-leonardos...)? The goal of today's challenge is to copy data from one disk to another, problem is that the disks are not directly connected. Luckily they are in a huge grid, and you have to find a way to copy the data through adjacents disks, while honoring the disk usage (you cannot copy to a disk where data is already stored). The input is a df-like disk usage listing. The first challenge is to calculate a list of disks that can copy data. The challenge of day 21 is about scrambling passwords. We are almost there : after this challenge, only 5 days left till the end of this advent of code (I cannot wait to get my life back !) . The challenge of day 20 is about a list of integer ranges. Some ranges overlap, but there are also values that are outside any range. You have to find out what is the lowest integer that is outside any range. Today's challenge is a variation on the White Elephant gift exchange (https://en.wikipedia.org/wiki/White_elephant_gift_exchange), in this case, by a bunch of Elves where only one can have all gifts. Each Elf brings a present. They all sit in a circle, numbered starting with position 1. Then, starting with the first Elf, they take turns stealing all the presents from the Elf to their left. An Elf with no presents is removed from the circle and does not take turns. The challenge is about avoiding traps. For the next rows, the state of a tile is calculated related to the tiles in the previous row (same position, tile left and tile right). If the tile is at an edge, the non-existing tile at the previous row outside the edge is considered safe. The challenge today is again a-maze-ing (as a wellknown president would say). The maze has a bunch of doors ( | and - on the drawing), but they can be locked depending on a hash that you need to calculate every step. When you visit a location a second time, the lock on each door can be different from the previous time ! The challenge of day 16 is about generating random data using a modified version of a dragon curve (you can find more info on fractal curves like Dragon here : https://en.wikipedia.org/wiki/Dragon_curve). The challenge for today consists of capsules that bounce through a maze of spinning discs. The capsule can fall through a hole of each disc if they hit the disc at position 0, each disc has a fixed amount of positions that rotate every second. The distance between the release and the first disc is one second, as is the distance between each consecutive disc as well. The challenge today is about some basic cryptography : you will have to generate data for a one-time pad (OTP) (see https://en.wikipedia.org/wiki/One-time_pad for more info). You need to generate keys by taking the MD5 of a pre-arranged salt (your puzzle input), and an increasing integer index starting with 0. - If the number of bits that are 1 is even, it's an open space. - If the number of bits that are 1 is odd, it's a wall. Today, you need to make a compiler for the language assembunny. The challenge today is about microchips and generators. A microchip belongs to one particular generator, and the two can be on the same floor, or in the same elevator. But if a microchip is with another generator on the same floor or elevator, it will get toasted, except if his own generator is also on the same floor/elevator. In today's challenge, you have to execute instructions that control how bots are handling microchips. Today's challenge is about decompressing input that is compressed in an experimental format. In the format, markers indicate how much time a number of characters need to be repeated. The input in today's challenge consists of an encrypted name, a dash, a sectorID, a dash and a checksum between brackets. A name is real if the checksum is equal to the five most common letters in the encypted name. Advent of Code 2016 Day5: How about a Nice Game of Chess? The challenge of day 5 is to calculate a password of 8 characters by finding the MD5 hash of the input and an increasing integer index. The password is constructed by taking the 6th character of the first 8 hashes that start with 5 zeroes (in hex representation). In today's challenge, you have to repair the communication with Santa : messages are coming in, but jammed. By using repetition code (see also https://en.wikipedia.org/wiki/Repetition_code), you can find out what's in the message : by sending the same message a number of times, you can calculate which characters are most frequent on each position and find the most likely message. For the complete explanation of the challenge, go to http://adventofcode.com/2016/day/8. Your input (http://adventofcode.com/2016/day/8/input) consists of a series of three basic instructions to control the display of a screen. The goal of the first part of the challenge is to calculate how much pixels will be lit after all instructions are executed. The imaginary ipV7 addresses support TLS if they contain an ABBA sequence outside square brackets and no ABBA sequence inside brackets. (ABBA : any 4 character sequence where the first pair are 2 different characters followed by the reverse of that pair).